Founded in 1961 as a single specialty camera store in the charming and historic neighbourhood of Kerrisdale in Vancouver, Kerrisdale Cameras now has 7 stores in Greater Vancouver and Victoria. 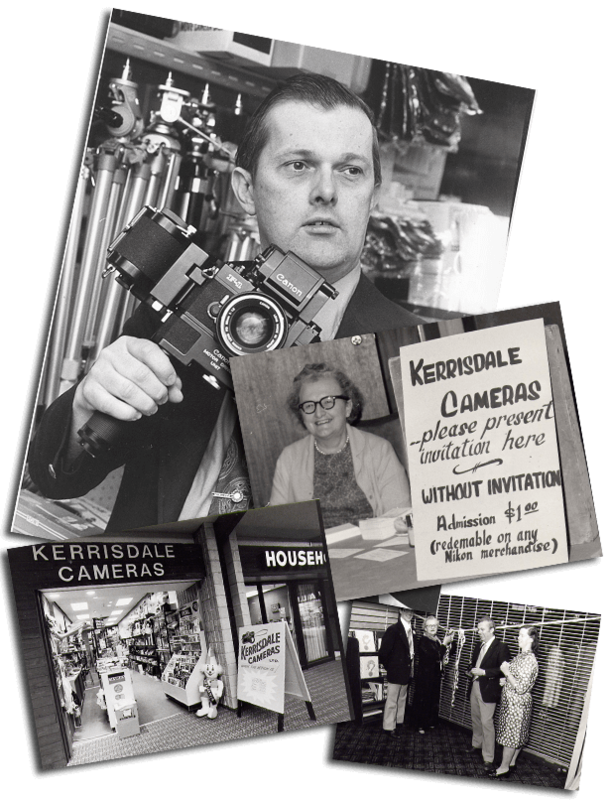 On August 6, 1961 Kerrisdale Cameras first opened its doors when my father, Bob Hudson, and my grandmother, Mary Hudson, opened a small camera shop in the quaint Kerrisdale neighbourhood across from Safeway, where he had worked while attending UBC. Originally called West Van Camera, they opened their first branch store in West Vancouver. Later renamed to Kerrisdale Cameras as we grew and began advertising throughout the lower mainland. Over the coming years, the location moved several times with the 5th move in 2011 to its current location at 1534 Marine Drive. Store #3 opened on Lonsdale in North Vancouver. The North Van store moved a couple times over the decades within the same block, now located at 1833 Lonsdale Ave.
Store #4, our Burnaby store, opened in 1971 in Old Orchard Shopping Centre on Kingsway. The Vancouver store expanded and added a warehouse and office while expanding the retail store which became known as the Main Store. Store #5 opened in Guildford Town Centre in Surrey, in the north end of the mall next to Super Valu and Eatons. A few weeks before Christmas, the Richmond store opened on No. 3 Road, across from Sears. Coquitlam Centre opened its doors in the growing community of Coquitlam and we were one of its original tenants. Over the coming years, we moved from the food court area as they expanded and renovated to our current location between Sears and Scotiabank. Coquitlam is store #7. As changes took place in the north end of Surrey’s Guildford Town Centre, including closing of SuperValu and Eatons, we closed our Surrey store. Then, opened our store in Victoria, located in Saanich Plaza by Save On Foods. We launched our first website, one of the first in the photo retail industry. My grandmother and company co-founder, Mary Hudson, who had continued to work part-time five days/week retired in her late 80’s. Sadly, my father passed away suddenly from heart failure on Sept 11, 2011, just one month after the company's 50th anniversary. He had continued to run the business and work five days a week until just a few days before. I had joined them in 1981, while attaining my business degree at SFU, and worked alongside my dad for 30 years. Over those years, he taught me not only how to run a successful retail business but, most importantly, he showed me the importance of treating employees, customers and suppliers honestly, fairly and with respect…traits that we also look for in our employees. My father loved the photo industry and particularly the older cameras. Trade-ins were always one of his favorite parts of our business and have made us different from our competitors. His incredible memory of both cameras of yesteryear as well as the latest digitals kept him busy every day as he evaluated the daily trades. His love of older cameras has continued in many of our employees, enabling us to continue to accept trade-ins and offer a huge selection of used equipment. One by one, our stores were updated and renovated. As changes were taking place in our industry, including the closing of some competitors' stores, the opportunity arose in the spring of 2013 to buy a competitor's store in Langley's Willowbrook shopping centre. We hired their team of five employees who have remained with us. Since then, we hired six of their peers from their former employer's other stores. With store #8, we became the largest specialty photo retailer (No competitor has more stores than us!) in BC and one of the largest in Western Canada. In November 2015, we closed our original Richmond store after 40 years on No. 3 Road and opened a bigger and brighter new store in the Ironwood neighbourhood in south Richmond, next to Canadian Tire. In June, our North Vancouver store moved five blocks north to 1833 Lonsdale Ave.
After 51 Years in West Vancouver we were forced to vacate & close the store with limited notice due to structural problems with the building. We'll be looking for another store location opportunity in the lower mainland in the next year or two.